Significant developments have been made in space-based radar systems and technology since the first satellite with a radar payload was launched (the Gemini radar). This paper presents an overview of some of the remote sensing applications of satellite imaging radars, which range from topographic mapping to forest and climate monitoring to the detection of oil spills and the monitoring of natural disasters, to name just a few. Imaging radar systems (Radio Detection and Ranging) were developed in the 1950s mainly by the armed forces. Radar is an active remote sensing system which means that it provides its own source of energy to produce an image. It therefore does not require sunlight (as do optical systems) and data can be acquired either by day or by night. Furthermore, due to the specific wavelength of radar, cloud cover can be penetrated without any effect on the imagery. 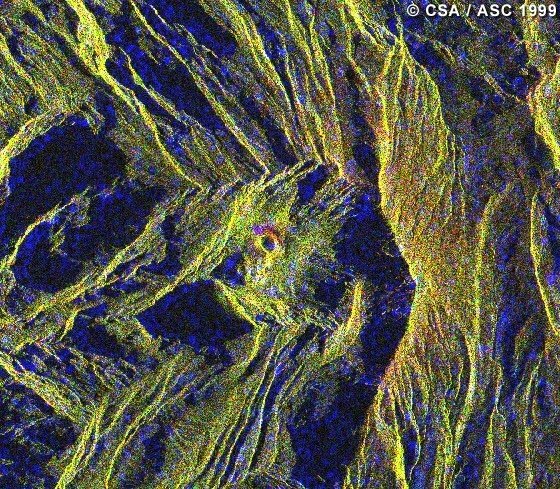 Synthetic Aperture Radar (SAR) is a technique for creating high resolution images of the earth's surface. Over the area of the surface being observed, these images represent the backscattered microwave energy, the characteristics of which depend on the properties of the surface, such as its slope, roughness, humidity, textural inhomogeneities and dielectric constant. These dependencies allow SAR imagery to be used in conjunction with models of the scattering mechanism to measure various characteristics of the earth's surface, such as topography. SAR has become a valuable remote sensing tool for both military and civilian users. Military SAR applications include intelligence gathering, battlefield reconnaissance and weapons guidance. Civilian applications include topographic mapping, geology and mining, oil spill monitoring, sea ice monitoring, oceanography, agricultural classification and assessment, land use monitoring and planetary or celestial investigations. The image shows a SAR radarmap covering the whole of Germany. The data used have been acquired by the high-resolution SAR sensor onboard the remote sensing satellite ERS-1. 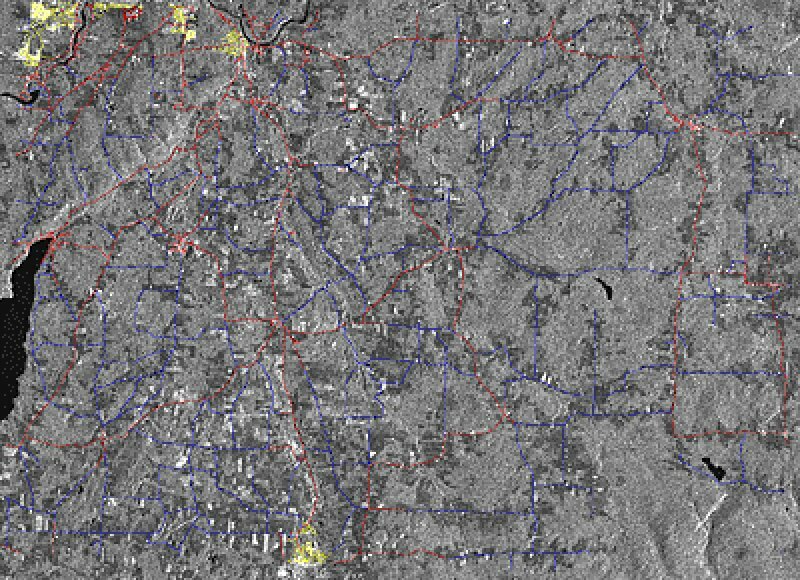 From 150 geocoded terrain corrected scenes an image mosaic with a pixel size of 25m has been composed, which provides a data base for diverse applications. Another highly active research area in radar remote sensing is repeat pass satellite SAR interferometry (InSAR). 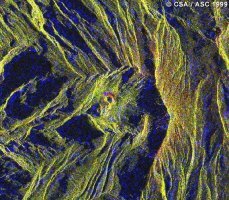 InSAR provides a means for measuring displacements of the solid earth, glaciers, ice sheets, and fast sea ice to an accuracy of fractions of a radar wavelength (a few cm) during the time intervals between observations, using synthetic aperture radar (SAR) imagery. 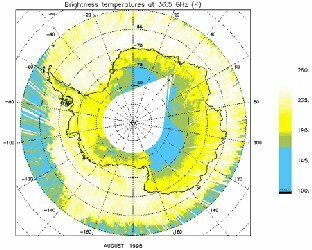 Since the launch of the first European Remote Sensing satellite (ERS-1) in 1991, this rapidly-evolving technology has been employed to measure, for example, coseismic displacements; the motion of glaciers and ice sheets in Alaska, Greenland, Antarctica and elsewhere; retreat of the grounding line of a major West Antarctic ice stream; deflation of a European volcano following an eruption; and crustal extension of potentially active volcanic vents in SW Alaska. 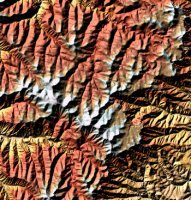 In addition, InSAR can be employed to derive digital elevation models (DEMs) of the Earth's surface. 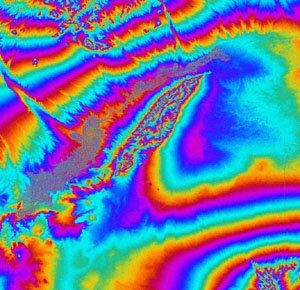 Other applications of InSAR include prediction of earthquakes and volcanic eruptions, ice flow mapping, forest mapping and land classification. The limitations caused by atmospheric effects presently seem to be the most fundamental and severe limitation for this otherwise incredibly sensitive technique. Furthermore, the correlation map that used to be "just" a byproduct of the interferometric processing, and at best a measure of the interferogram quality, is now becoming important information in itself. 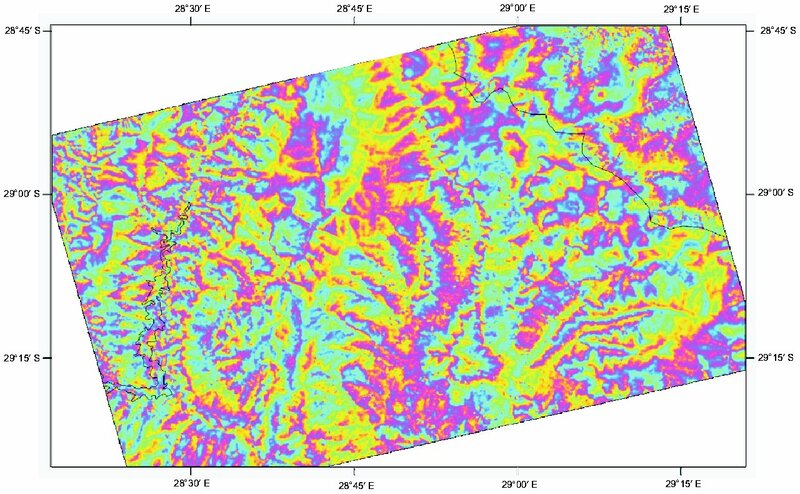 Correlation maps are used for volume scattering estimation and forest height measurement as well as for land use classification. 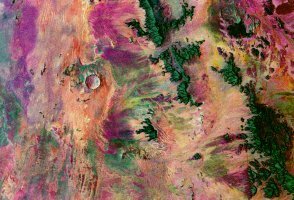 The scene shows an area near White Sands, New Mexico, USA and covers approximately 50 km x 150 km. The individual phase values appear as coloured rings. The steeper the slopes, the closer the fringes. Topography can already be seen directly in the interferogram. Another application area in radar remote sensing is hydrology, including the retrieval of soil moisture and snow water content, glaciology, and radar mapping of vegetation. 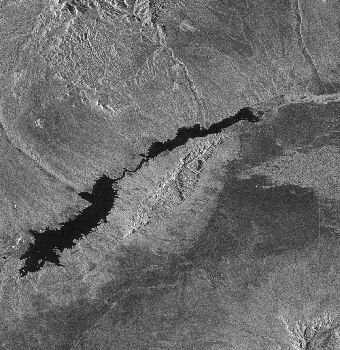 Hydrology is an area where SAR and also active imaging radar of lower resolution have much to offer. In relation to soil moisture estimation, polarimetric data have proven capabilities. Difficult problems include the vegetation cover and the requirement that the soil type/texture needs to be known. There is, however, hope that these problems can be mitigated. Using lower frequencies, e.g. P-band, enables penetration of low to moderate vegetation. More interestingly, the soil texture can potentially be estimated from a time series of measurements during a drying period following precipitation. False colour intensity composite of two ERS passes over the Welkom goldfields. The mapping of forest and biomass, as well as agricultural crops, are also active application areas. Many techniques show promise with respect to forest and biomass mapping and it has been shown that the backscatter coefficient of very low frequency systems (UHF and VHF) does not saturate at as small biomass values as the more common frequencies at L-band and C-band. The following is a list of some of the more well-known spaceborne remote sensing platforms and sensors. A more complete list can be obtained from http://quercus.art.man.ac.uk/rs/sat_list.cfm which currently lists 87 remote sensing platforms and sensors. - European Remote Sensing Satellite 1 and 2. The first satellite in the ERS series was launched in June 1991, and its successor (ERS-2) in April 1995. Since 1991, an almost global coverage of the Earth's surface has been attained with the satellite's SAR (Synthetic Aperture Radar) instrument. The ERS satellites have Sun-synchronous, near polar, quasi- circular orbits with a mean altitude of 785 km and an inclination of 98.5° . Most of the ERS-1 mission was performed with a 35-day cycle. ERS-2 only operates in a fixed repeat cycle of 35 days, which means that a particular site is covered every 16 days (figures for Equator latitude). ERS multi-look intensity image and the flattened interferogram of the Western Cape region. Tandem ERS data was used at UCT to derive a DEM of the Cape Town area. This turned into a study of aberrations found in single antenna interferometry. The aberrations have been attributed to atmospheric perturbations, or inconsistencies between image acquisitions. 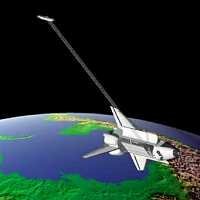 - Japanese Earth Resources Satellite - 1. - A JPL lead US project, "low-cost", lightweight, L-Band system, focused on interferometric SAR applications, e.g. natural hazards (seismic and volcanic deformation), ice flow velocity mapping; and low frequency applications, including biomass mapping, soil moisture, and snow water equivalent mapping. - Commercial, very similar to ERS. - Solid Earth Interferometric Spaceborne Mission, a French concept, based on the basic idea of implementing a low cost SAR which will extend the ERS-1/2 capability and ensure acquisition of data for very long time span interferograms in areas where coherence allows such long baselines. Key applications would for instance be forest clear-cut monitoring. - Shuttle Radar Topography Mission. The SRTM mission is an important milestone in the history of remote sensing. In eleven days it collected about 18 Terabytes of radar measurements which will allow scientists to virtually reconstruct a 3-dimensional model of 80% of the Earth's continental area. The collected radar images will be converted to digital elevation models (DEMs) spanning the globe between 60° North and 58° South. The "virtual Earth" will be reconstructed as a mesh of 30 m spacing, and is accompanied for each point by a measure of the reflected energy of the radar signal, the intensity image. These data will become an important reference for comparison and correlations with older and future satellite or other Earth Observation (EO) data. 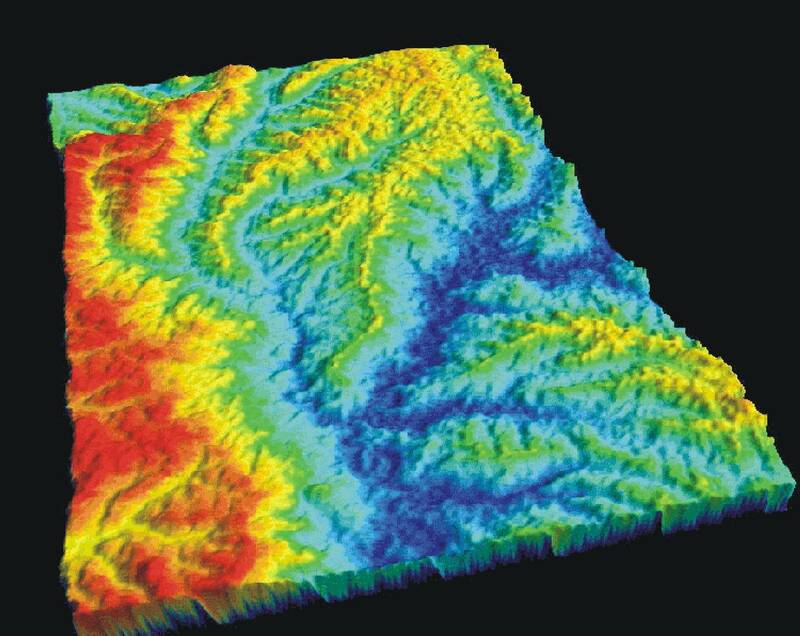 SRTM is a valuable asset for many applications ranging from geology, tectonics, hydrology, cartography, to navigation and communications. 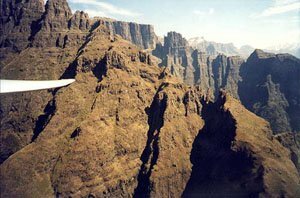 The most elevated stretch of the Drakensberg, in eastern and southern Lesotho, is composed of severely eroded basalt capping a sandstone base. 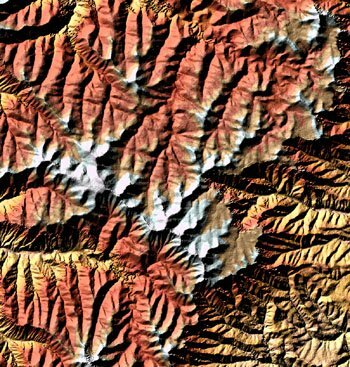 Its pinnacles and broken and fractured blocks present a steep eastern scarp along the length of the border between Lesotho and KwaZulu/Natal. Wind scatterometers use accurate measurements of the radar backscatter from the ocean surface when illuminated by a microwave signal with a narrow spectral bandwidth to derive information on ocean surface wind velocity. At a given angle to the flight path of the satellite, the amount of backscatter depends on two factors, namely the size of the surface ripples of the ocean and their orientation with respect to the propagation direction of the pulse of radiation transmitted by the scatterometer. The first is dependent on wind stress and hence wind speed at the surface, while the second is related to wind direction. 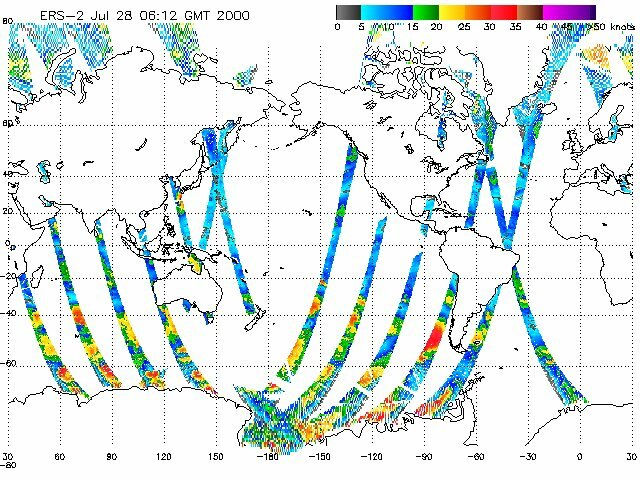 This map displays the ocean surface winds at 10m on the 28th July 2000 from the ERS-2 scatterometer. Scatterometer instruments aim to achieve high accuracy measurements of wind vectors, and resolution is of secondary importance. The resolution of the ERS scatterometer is 50 km, though the grid sampling is 25 km. Because the scatterometer operates at microwave wavelengths, the measurements are available irrespective of weather conditions. The assimilation of scatterometer data into atmospheric forecasting models greatly improves the description of cyclonic features so important in predicting future weather patterns. There are numerous other applications, such as the measurement of sea ice extent and concentration, and emerging land applications such as regional-scale monitoring of ice shelves, rainforests and deserts. The radar altimeter is designed to make accurate measurements of the satellite's height above the sea surface which is then converted to the sea surface's height above a reference ellipsoid. When the altimeter takes a height measurement, it is measuring a height contributed to by many different types of phenomena, from the underlying marine geoid, through the large-scale general circulation of the oceans, to mesoscale eddies 100 km across. In addition to highly precise height measurements, the altimeter makes measurements of the heights of waves that appear in its footprint, and of surface wind speed. Information has been extracted from altimeter data, particularly that provided by the high resolution dedicated Geodetic Mission of ERS-1, to provide maps of average sea surface topography - the marine geoid. The geoid is the fundamental reference surface of geodesy. Through its use in geoid determination, altimetry aids in revealing the location of ocean floor features such as faults, trenches, spreading zones, sea mounts and hot spots. Information may also be gained on the age, structure and dynamics of the lithosphere, particularly in the area of subduction zones, leading to a better understanding of the relationship between the lithosphere and the mantle, and of mantle convection. Additional, commercially valuable information can be derived on potential locations of oil-bearing structures using the effect that low density deposits (such as crude oil) have on the shape of the gravity field. This information has been derived not only over oceans, but also in the Arctic Ocean, using altimetry over sea ice. The radar altimeter also measures the heights of waves that appear within its `footprint', and the wind speed at the sea surface. Near real time measurements of Significant Wave Height (SWH) by the ERS altimeter are assimilated operationally into wave models to provide wave forecasts, essential for the optimisation of a range of marine operations. Measuring the topography of the oceans. Worldwide sea level varies significantly in space and time. Regional variations in sea level occur as a result of pressure differentials within the ocean, which result from momentum and heat flux exchange with the atmosphere. The resultant differences in sea level are thus directly related to ocean currents. Ocean topography can be measured directly and monitored for change using the ERS radar altimeter. Along with data from other similar instruments, the information can be assimilated into ocean circulation models which transform satellite surface information into three-dimensional descriptions of ocean currents and transports. An important fluctuation in the ocean-atmosphere system is the El Nino Southern Oscillation (ENSO) phenomenon, which causes an increase in ocean temperatures throughout the central and tropical Pacific which can produce dramatic changes in climate on the timescale of months to years. The events associated with ENSO can be measured in sea surface topography by the ERS altimeter, and in sea surface temperature by the ERS Along Track Scanning Radiometer (ATSR). 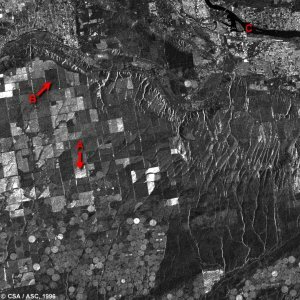 Remote sensing data from the ERS-2 ATSR-2 allows the monitoring of agricultural fires and wildfire distribution on a global scale and in near real time. All hot spots (including gas flares) with a temperature higher than 312 K at night are precisely located (better that 1 km). Data from the ATSR sensor is also used for volcano monitoring applications and measuring ocean skin temperatures. Atmospheric ozone and NO2 global monitoring have been going on since GOME products became available (July 1996). Additional applications could stem from on-going scientific studies, as GOME data can also be used for retrieving other trace gases relevant to the ozone chemistry as well as other atmospheric constituents and climatic variables like clouds, aerosols and solar index, all of which are crucial for assessing climate change. The ERS-2 microwave sounder is being used to monitor the Antarctic ice cycle. Mapping the radiometric properties of the ice-shelf, which has a slower time evolution than the atmosphere and the ocean, provides a valuable input for the understanding of the growth, decay and dynamics of ice sheets. This in turn is fundamental to the understanding of environmental and climatic changes. brightness temperatures, due to its high emissivity) is in yellow. Most of the man-made illegal or accidental spills are highly visible on radar images. Ships can be detected and tracked from their wakes. Natural seepage from oil deposits can also be observed, providing hints for the oil industries. Scientists are studying the radar backscatter from the ocean surface which is related to wind and current fronts, eddies, and internal waves. In shallow waters SAR imagery allows one to infer the bottom topography. The topography of the ocean floor can be mapped using the very precise ERS Altimeter, because the sea bottom relief is reflected on the surface by small variations of the sea surface height. The ability of SAR to penetrate cloud cover makes it particularly valuable in frequently cloudy areas such as the tropics. Image data serve to map and monitor the use of the land, and are of increasing importance in forestry and agriculture. 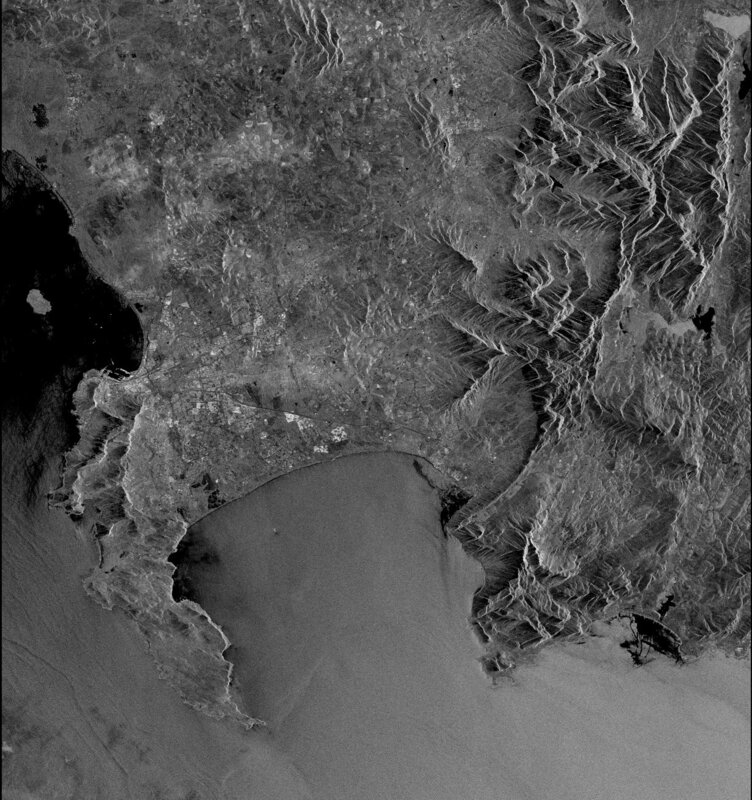 Some geological or geomorphological features are enhanced in radar images thanks to the oblique viewing of the sensor and to its ability to penetrate (to a certain extent) the vegetation cover. SAR data can be used to georeference other satellite imagery to high precision, and to update thematic maps more frequently and cost-effectively, due to its availability regardless of weather conditions. Interferometric SAR (InSAR) can be used, under suitable conditions, to derive elevation models or to detect small surface movements, in the order of a few centimeters, caused by earthquakes, landslides or glacier advancement. This interferometric technique has strengthened as a result of the first ERS-1/ERS-2 Tandem phase, which lasted for about 9 months (until May 1996). 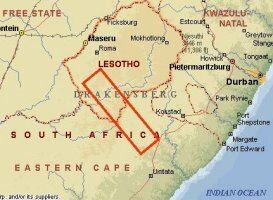 model of part of Lesotho. 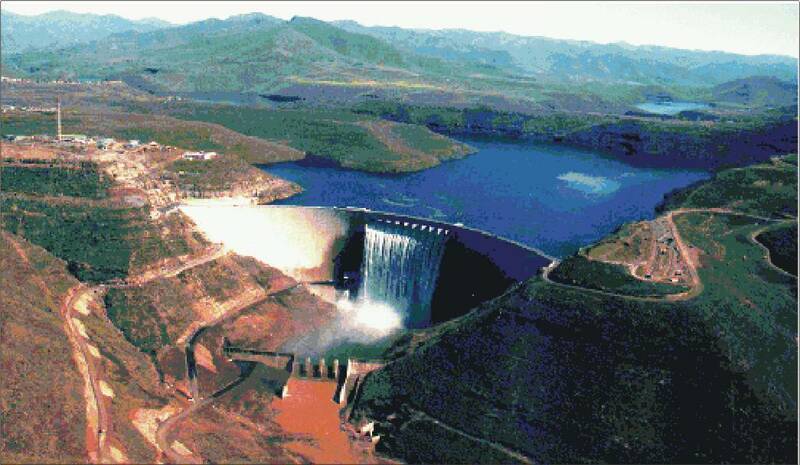 185 m concrete arch Katse dam. loading effect of a large reservoir. Climate monitoring concerns the monitoring of the atmosphere and of other components of the earth system as well as the monitoring of global climate indicators (e.g. global mean earth surface temperature and precipitation). Satellite measurements appear to satisfy the need for global measurements. The earth climate shows great variability over different time scales spanning from decades to thousands of years and more. Past climatic conditions are studied by analysing ice cores, sea/lake sediments, shorelines movements, tree pollen, etc. Numerical experiments are also run in which a Global Circulation Model is used to explore the possible climatic changes related to, for example, the Earth axis oscillations. Knowledge of past climate can help in predicting the future. Abrupt changes may serve in the identification of thresholds values that can trigger a non-linear behaviour of the earth system (and hence may cause high variations). The overlapping of climate variability on different time scales is the very challenge in predicting climatic changes. A fundamental role in the determination of the earth climate is played by the solar radiation reaching the earth affecting the ground surface energy balance. The radiation spectrum at the earth is strongly influenced by atmospheric constituents: not only the amount of radiation but also its spectral distribution is crucial. One of the most significant environmental concerns worldwide stems from oil pollution. During the last thirty years, pollution of the world's oceans, particularly in coastal areas, has become a matter of increasing international concern. In spite of rigorous controls, deterioration of water quality, especially in waters subject to heavy shipping, continues at a high rate. Due to the relative volumes of discharges, illegal emissions from ships represent a greater long-term source of harm to the environment than infrequent large scale accidents. Monitoring illegal discharges is thus an important component in ensuring compliance with marine protection legislation and the general protection of coastal environments. Traditionally, this service uses airborne patrols which are expensive and provide often only patchy coverage. Fast delivery SAR products are proving to be of great value in the optimisation of air-borne surveillance resources, due to the large area they can image at any one time. Size, location and dispersement of the oil spill can be conveniently determined using this type of imagery. The “Sea Empress”, a 147,000 ton supertanker, ran aground on rocks in the south of Wales, on the evening of February 15th, 1996. 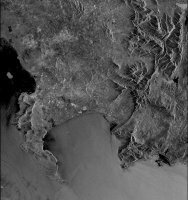 Seven days later, RADARSAT captured this image, clearly delineating the remaining oil slick. Size, location and disperse-ment of the oil spill can be conveniently determined using this type of imagery. The spill appears on the image in black tones. SAR imagery, acquired under suitable ocean current and surface wind conditions allow the bottom topography for an area of tidal sea to be visualised. This imagery is then used to infer bathymetry using a numerical inversion procedure. Combining conventional echo sounder data from a survey track with SAR imagery can shorten survey times considerably, producing a bathymetry map of the required accuracy and thus representing a major saving in costs. Knowledge of the whereabouts and activities of ships in coastal regions is useful to a range of government and law enforcement agencies, such as those concerned with enforcing legislation regarding fishing activities in Exclusive Economic Zones, and environmental protection agencies to support pollution control. The information is also of use to the coastguard for use both in search and rescue operations and in law enforcement activities, to supplement land-based coastal surveillance radar which has a maximum range of under 100 km. It has long been recognised that satellite-based radar has the ability to detect and monitor vessel traffic. Due to the nature of the radar, monitoring can take place through cloud cover and at night thus proving an advantage over optical data. As well as detection of vessels it is possible to derive various characteristics of each vessel such as location, speed, heading, and broad class of vessel. In the original mission objectives, observing the land surface was viewed as an experimental application for ERS-1 data. However, the ability to monitor crop development and forestry changes independent of weather conditions, offers a major potential application area for ERS data. An important technique which has been developed for terrestrial applications is multitemporal SAR analysis. Three input SAR datasets, acquired at different times, are assigned the colours red, green or blue. 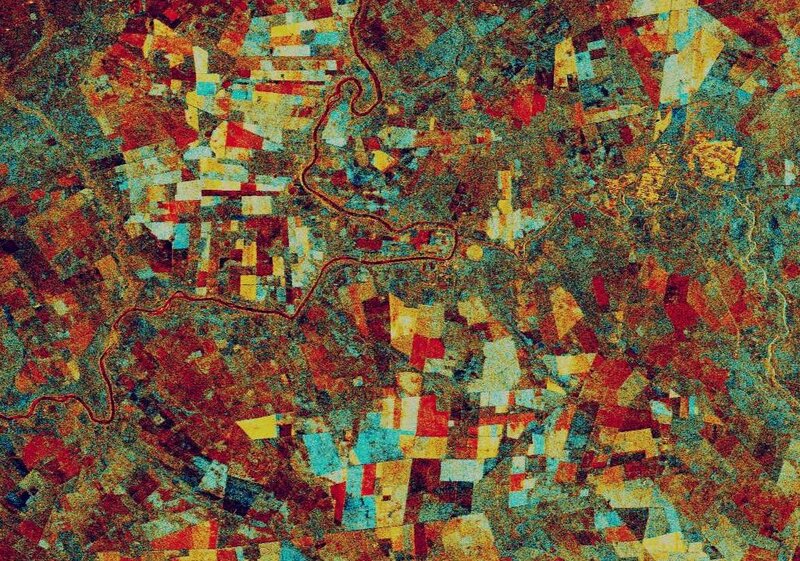 Changes between acquisitions can then be detected by observing the colours that appear in the image which reflect the change in the state of land cover. Crops planted at varying times and developing at varying rates can be identified, increasing the accuracy with which crop areas can be mapped and acreage estimated. Multitemporal analysis is also being applied to monitor logging in forested areas. Monitoring of the Common Agricultural Policy of the European Union, in particular the implementation of the so-called `set-aside' agreement in which farmers are paid subsidies to limit their production, is now undertaken partly with Earth Observation data. 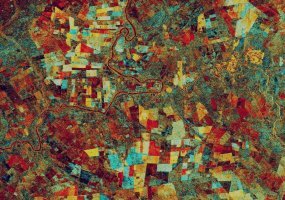 Earth Observation data also provides a common data source and standardised methodology for the collection of agricultural statistics. The use of ERS SAR data is gradually being introduced as part of this effort. Monitoring the scale of global crop production and trade has been identified as an area in which ERS SAR data may be able to assist. In particular in South East Asia, several governments are now looking into the use of ERS data for monitoring their rice crops. 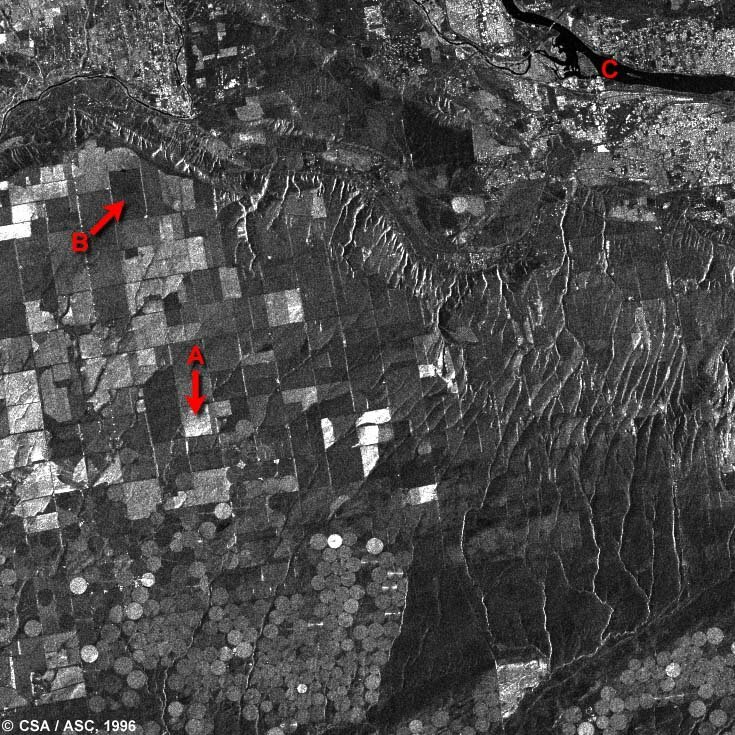 This RADARSAT image shows an agricultural region in the State of Washington. The circular features seen near the bottom of the image are created by a central pivot irrigation system. The brighter circles could be indicating either the presence of vegetation or an increase in the amount of moisture in those fields. A bit to the north, there is an area characterized by rectangular field patterns. The brighter fields (A) are vegetated while the darker (B) are bare. To the east, a striking dendritic drainage pattern is visible. The requirements for information on the world's forests are varied. Some established mapping and monitoring systems are introducing ERS SAR data, and other organisations are starting projects as a result of having access to this new source of data. ERS provides information for maps of forest extent and type in tropical areas which have not previously been mapped due to almost continuous cloud cover. SAR data are being used as the unique data source, and in conjunction with other remotely sensed data, to map forest damage, the encroachment of agriculture onto forested areas unsuitable for development, and in general to provide inventories of timber areas. As known global oil and gas reserves diminish, oil companies are under a great deal of pressure to tap new sources. In the past few years, exploration managers have been looking increasingly to frontier areas offshore, such as the Arctic and South East Asia to supplement existing reserves. Exploration in these frontier areas brings a whole new set of problems, since these areas have seldom been surveyed by conventional ship survey methods, and additional problems may exist through harsh environmental conditions, especially in the Arctic. 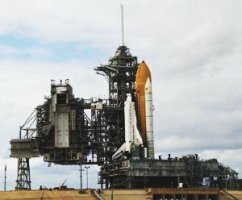 In order to make large scale surveying of as yet unexplored regions as cost-effective as possible, exploration managers are looking to new methods, such as the use of satellite data. A number of studies have been conducted at UCT in which SIR-C and traditional optical and infra red imaging data have been evaluated for palaeodrainage and general geological mapping in NW South Africa and Southern Namibia. 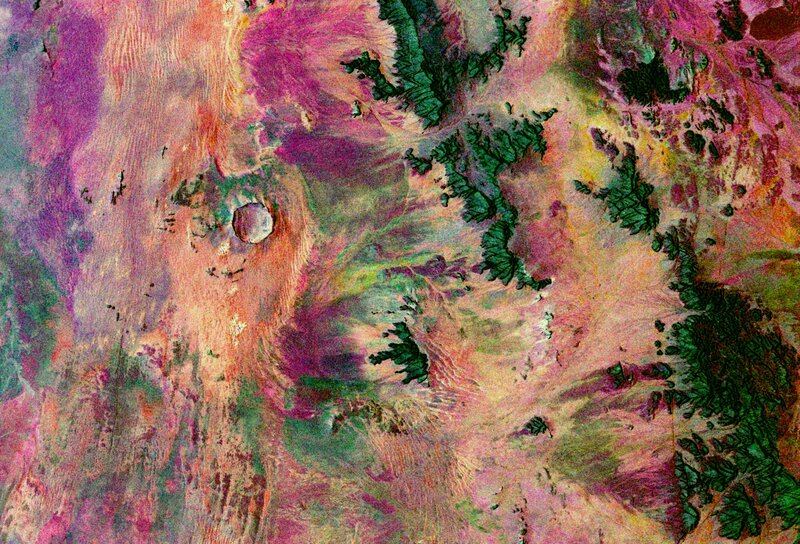 This is a SIR-C image of the Roter Kamm meteorite impact crater in Namibia. Of particular interest was the possibility of surface penetration of the dry sand in this region by the SIR-C radar bands. The identification and mapping of terrestrial structures related to hydrocarbon and mineral deposits is the key to many individual applications within geology, such as general geological mapping and mineral deposit location. Ground based surveys can often experience difficulty in the detection and mapping of large scale lineament features which indicate deposits, whereas they are often readily visible from satellite imagery such as SAR due to its side look viewing geometry. Conventional methods of surveying an offshore area are gravity, magnetic and seismic surveys by ship, which are labour intensive and expensive especially on a regional scale for the purposes of preliminary surveying. Gravity anomaly maps derived from altimetry from ERS and other satellite missions provide an alternative to these expensive ship surveys for a regional overview of the potential existence and position of viable deposits. The expense involved in such a survey is so vast that even small percentage savings on current operational costs make the use of satellite-derived alternatives very attractive to industry. The ERS-1 Geodetic Mission, completed in 1994, provides geographically uniform coverage up to latitudes of 82 N, of a relatively high spatial resolution dataset for deriving gravity anomaly. Natural oil slicks on the sea surface due to seepage arising from sub-sea hydrocarbon deposits can be identified and analysed using ERS SAR images. It requires a considerable volume of data as the location of the oil-bearing structures must be studied using data over a long time series. However, combined with satellite-derived gravity maps which reflect the regional structure of the lithosphere, the economic potential of a particular basin for hydrocarbon exploitation can be estimated. The financial implications in the provision of such a service are considerable. Savings in time and expenses that are realisable using these methods provide a potential market estimated to be in the region of US $5-10 million per annum worldwide. 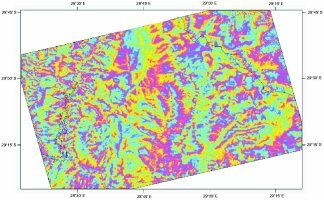 There is already a high degree of acceptance of the use of optical EO data in geological mapping applications due to the logistics and economics involved in locating features such as base metal deposits or hydrocarbon reserves. 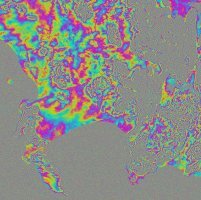 Unique properties of SAR data are now being exploited to aid further the exploitation of natural resources by detecting the lineament features and anti-cline structures which may indicate the presence of mineral deposits. 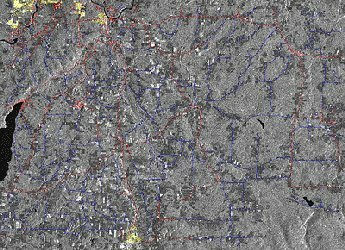 Due to it's side look viewing geometry SAR data is particularly effective in identifying these geological features, and in detecting them even when masked by vegetation. Highly developed areas of the world have been mapped to a very high accuracy and precision, using ground and aerial surveying methods which are on the whole expensive and labour intensive. However, particularly in the frontier regions where an impact from human development is being felt, the land's topography is still poorly mapped and any existing maps are out-of-date or of insufficient scale. A cost-effective method is required for the production of new maps, and updating old ones. The world's mapping industries are currently experiencing rapid technological and organisational change. Increasingly, information is needed in digital formats enabling sophisticated analysis to be undertaken, producing products such as digital terrain models, over which land cover information can then be draped. Digital data are also of great value in the rapidly expanding market for GISs, which are now being used extensively to integrate data from different sources for land management, monitoring and planning. The cartography market has always been important in the development of commercial applications of EO data, and ERS is no exception. The use of ERS-1 SAR data is providing a marked improvement in the accuracy of maps produced for developing countries. The SAR data are being combined with data from optical sensors such as SPOT to help increase the thematic and in particular the geolocation accuracy of the latter. The use of interferometric techniques for the production of digital elevation models is potentially a major application of SAR data. Topographic maps are being compiled from ERS data for areas of the world not previously mapped because of their remote location and high frequency of cloud coverage. This information is of value to a range of activities, from managing land-use development to planning logistics of deposit exploration. Earth observation data from the ERS satellite is helpful in the assessment and/or forewarning of a range of environmental risks and hazards in the marine environment, whether natural or manmade. Warning or forecasting systems may cover: risk assessment and management, hazard monitoring and forecasting, warning formulation, transmission and dissemination of warnings, and response mechanisms. The emphasis of the use of spaceborne SAR data for monitoring sea ice and illegal oil spills is in complementing existing data sources, and optimising conventional monitoring and response mechanisms. This is due to the temporal and spatial coverage characteristic of satellites. ERS-2 Low Bit Rate data however, which is acquired more or less continuously, can provide the primary data source for certain marine services, where data collected from in-situ measurement techniques such as buoys do not exist. Marine conditions change very rapidly and can vary considerably between locations only a few kilometres apart. Errors in the planning of marine operations dependent on favorable conditions can be economically damaging, and in extreme cases even cost human lives. Consequently, weather and sea-state forecasts are critical to activities such as ship routing, fishing, management of offshore operations and coordinating rescue services, all of which require accurate and reliable information within a few hours of observation. To serve this marine market, the ERS Low Bit Rate fast delivery data stream, the development of appropriate ocean and weather forecasting models and data assimilation schemes, and an operational mobile communications infrastructure are all essential components. The use of fast-delivery products from the ERS series radar altimeter, scatterometer, SAR and ATSR instruments can improves the accuracy and coverage of weather and sea-state forecast services. ERS offers consistent and geographically homogeneous data, for monitoring and forecasting of frontier areas where such a service did not previously exist, due to lack of sufficient coverage by ships of opportunity. Information on the local climatology of waves is important in minimizing risks for a wide range of marine activities, such as locating offshore installations, planning offshore operations, for coastal defence planning and for the planning of naval exercises and other major ship routing operations. Time series of sea state information are being developed as a basis for predicting conditions. For information on wave height, there exists presently ten years worth of data available from the Geosat, Topex-Poseidon altimeters as well as the ERS series. As this time series lengthens, the value of the information increases in terms of the ability to estimate seasonal climatologies, and predict extreme wave parameters such as the 50 year return waveheight. Information on the climatology of wave period and direction can also be derived from ERS instruments, useful modelling oscillations in coupled structures such as when fixing a riser pipe to an oil rig. Daily sea-ice information is required for navigation during winter throughout the northern Baltic, around Svalbard, the Greenland Sea, along the east coasts of Canada and northern USA, the Great Lakes, and during summer in the European, Russian and Canadian Arctic. Three to seven day forecasts are also needed for strategic planning. The type of information required includes location of the ice edge, estimates of ice type and it's concentration. Also important is measurement of ice drift and speed. The efficacy of Fast Delivery ERS SAR data has been demonstrated within well-established national sea-ice services. This use is based mainly upon manual interpretation, and is used as a complementary data source to traditional satellite sources such as Passive Microwave Radiometry, and low resolution optical data. In parallel, value-adding companies within Europe are developing the next generation of workstation which incorporate new techniques from the science community in order to automate feature interpretation and tracking. Additionally, demonstrations are being made of the use of ERS SAR data for shipping and offshore activities close to the ice edge. Ground-based measurements of volcano deformation can be used to assess eruptive hazard, but require the costly (and often hazardous) installation and maintenance of instrument network. It has been demonstrated that spaceborne radar interferometry can be used to monitor long term volcano deformation. The deformation associated with the last large eruption of Mount Etna (1991-93) was measured and interpreted using the InSAR technique for the first time on a volcano. Satellite images are revealing the growth of a lava dome. The appearance of such a new lava dome is significant because (1) it signals the presence of new magma within the volcano and (2) dome growth at volcanoes such as Guagua Pichincha is typically accompanied by explosive activity. The magnitude 7.3 Landers earthquake of 28 June 1992 ruptured over 85 km along a complex fault system in the Mojave Desert of California. The Landers earthquake sequence provided an ideal test case for radar interferometry, because its shallow depth produced spectacular surface rupture in an arid area less than three months after the ERS-1 satellite began acquiring radar images in its 35-day orbital cycle. 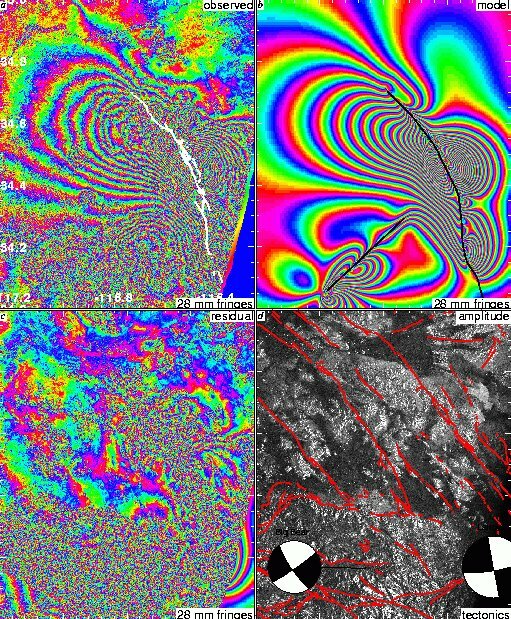 With 20 fringes in the shape of a crushed butterfly, the first earthquake interferogram illustrated the coseismic deformation field with over a million pixels. 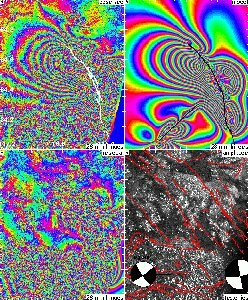 (a) Observed interferogram calculated from ERS-1 SAR images taken before (April 24, 1992) and after (June 18, 1993) the earthquake. Each fringe in parts a, b and c denotes 28 mm of change in range. The asymmetry between the two sides of the fault is due to the curvature of the fault and the geometry of the radar. Black lines denote the surface rupture mapped in the field. 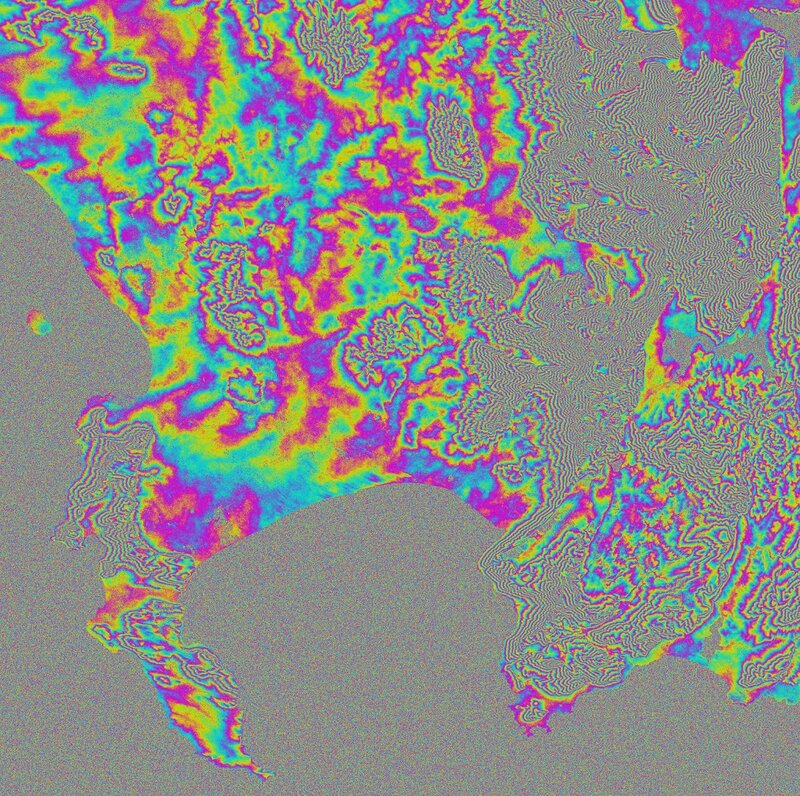 The altitude of ambiguity is 220 m.
(b) Modeled interferogram with black lines denoting fault patches included in the elastic dislocation model. (c) Residual (observed minus modeled) interferogram. (d) Radar brightness (amplitude) image. Bad weather and therefore dense cloud cover usually accompany floods, and therefore optical sensors cannot be used for monitoring purposes. Radar satellites, however, can penetrate the cloud cover with their microwaves, and thus deliver valuable information for future planning and prevention. The RADARSAT ScanSAR narrow data were acquired on August 12, 1998 at 6:20 AM local time. GIS data were overlaid on the RADARSAT image to provide a map reference for normal water levels. 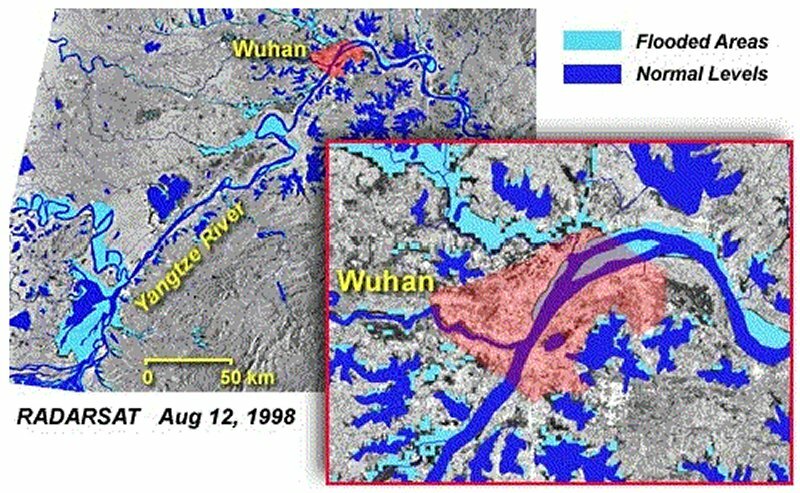 The resulting image displays non-flooded areas in grey tones, normal waters levels in dark blue, flooded areas in light blue and the urban area of the city of Wuhan in red. RADARSAT transmits a microwave frequency known as C-band (with a wavelength of about 5.6 cm). 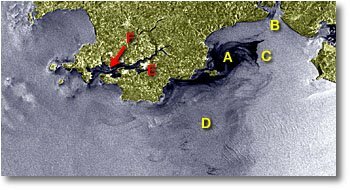 The RADARSAT images are a measure of the amount of energy reflected back to the radar antenna following interaction of the transmitted pulse with the ocean's surface. The degree of backscatter depends on the roughness of the surface at the scale of the radar wavelength. For the ocean surface, the short scale roughness is influenced primarily by the surface wind speed. Unlike optical sensors, radar waves can penetrate all weather conditions including clouds and rain. 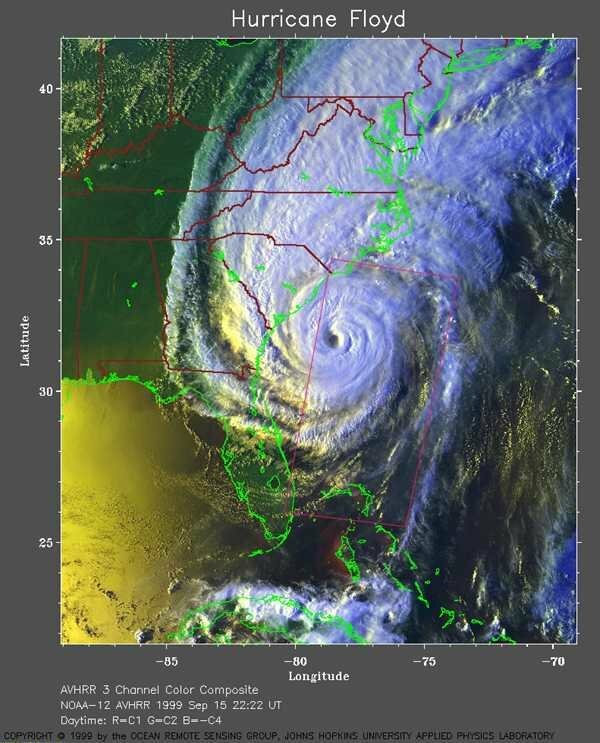 Having an all-weather imaging capability makes radar unique in being able to detect the effects of hurricanes on the ocean surface with high spatial resolution. 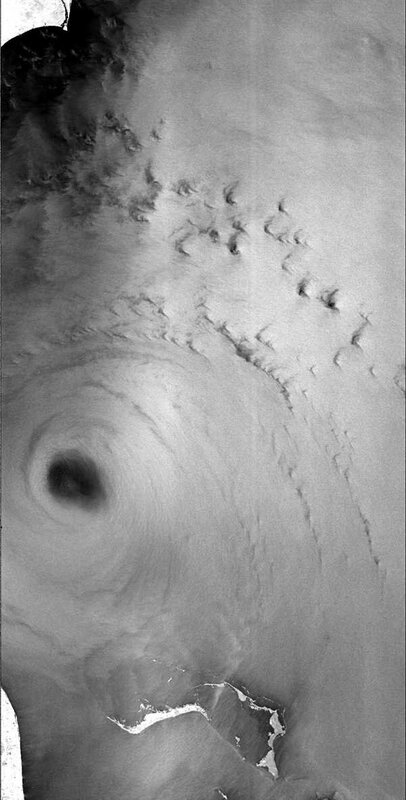 The hurricane features visible in the RADARSAT imagery are an imprint of the hurricane on the ocean surface roughness. 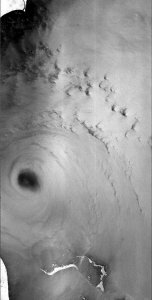 In the RADARSAT imagery, the eye of the hurricane appears darker than its surrounding area because the wind speed at the centre of the hurricane is lower. It has been shown that there is a wide range of applications for satellite imaging radar products. Furthermore, ongoing research and development is continually expanding the current range of applications. One of the most important characteristics of imaging radars is their ability to penetrate cloud cover and to acquire data either by day or by night. It is this all-weather capability that has contributed significantly to the many commercial applications of satellite imaging radar. M.G. Abdelsalam, C. Robinson, F. El-Baz and R.J. Stern, "Applications of Orbital Imaging Radar for Geologic Studies in Arid Regions: The Saharan Testimony," Photogrammetric Engineering & Remote Sensing, vol. 66, no. 6, pp. 717-726, June 2000. A. Beaudoin, T. LeToan, S. Goze, E. Nezry, A. Lopes, E. Mougin, C.C. Hsu, H.C. Han, J.A. Kong and R.T. Shin, "Retrieval of forest biomass from SAR data," Int. Journal of Remote Sensing, vol. 15, no. 14, pp. 2777-2796, 1994. C. Bechini, P. Canuti, S. Moretti, S. Paloscia and P. Pampaloni, "Microwave remote sensing for hydrological and agricultural monitoring," Proc. of 24th Int. Symp. on Remote Sens. Environ., ERIM, pp. 27-31, 1991. J. Cihlar, "Land Cover Mapping of Large Areas from Satellites: Status and Research Priorities," Int. Journal of Remote Sensing , vol. 21, no. 6/7, 2000. M. Coltelli, G. Fornaro, G. Franceschetti, R. Lanari, M. Migliaccio, J.R. Moreira, K.P. Papathanassiou, G. Puglisi, D. Riccio and M. Schwabisch, "SIR-C / X-SAR multifrequency multipass interferometry: A new tool for geological interpretation," Journal of Geophysical Research, vol. 101, pp. 23127-23148, 1996. M. D'Errico, A. Moccia and S. Vetrella, "High-frequency observation of natural disasters by SAR interferometry," Photogramm. Eng. and Remote Sensing, vol. 61, no. 7, pp. 891-898, 1995. M.C. Dobson, L.E. Pierce, K. Sarabandi, F.T. Ulaby and T. Sharik, "Preliminary analysis of ERS-1 SAR for forest ecosystem studies," IEEE Trans. Geosci. Remote Sensing, vol. 30, no. 2, pp. 203-211, 1992. M.C. Dobson, F.T. Ulaby and L.E. Pierce, "Land-cover classification and estimation of terrain attributes using synthetic aperture radar," Remote Sensing of Environment, vol. 51, no. 1, pp. 199-214, 1995. G.S. Doyle and M.R. Inggs, "Dual Frequency Multi-Polarimetric SAR as a Tool for Palaeo-Drainage Mapping in the Northern Cape Province," IEEE Proc. of the South African Symp. on Communications and Signal Processing, COMSIG'98, Cape Town, South Africa, pp. 339-342, September 1998. G.S. Doyle, M.R. Inggs, C.J.H. Hartnady and E. Rignot, "The Use of Interferometric SAR in a Study of Reservoir Induced Crustal Deformation," Proc. European Conference on Synthetic Aperture Radar, EUSAR'98, Friedrichshafen, Germany, pp. 95-98, May 1998. G.S. Doyle, A.J. Wilkinson and M.R. Inggs, "Contending with High Relief and Temporal Decorrelation in an InSAR Study of the Effects of Reservoir Loading," Proc. IEEE Geosci. Remote Sensing Symp., IGARSS'99, Hamburg, Germany, June 1999. M.R. 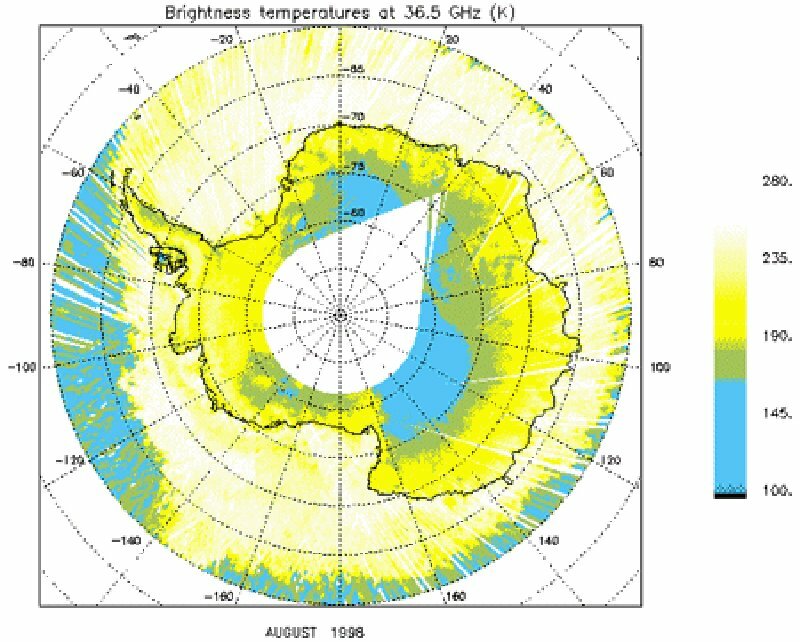 Drinkwater, R. Hosseinmostafa and P. Gogineni, "C-Band backscatter measurements of winter sea ice in the Weddell Sea, Antarctica," Int. Journal of Remote Sensing, vol. 16, no. 17, pp. 3365-3389, 1995. P.C. Dubois, J. van Zyl and T. Engman, "Measuring soil moisture with imaging radars," IEEE Trans. Geosci. Remote Sensing, vol. 33, no. 4, pp. 915-926, 1995. C. Elachi, "Spaceborne imaging radar: Geologic and oceanographic applications," Science, vol. 209, pp. 1073-1082, 1980. C. Elachi, Y. Kuga, K.C. McDonald, K. Sarabandi, T.B.A. Senior, F.T. Ulaby, J.J. van Zyl, M.W. Whitt and H.A. Zebker, "Radar polarimetry for geoscience applications," F.T. Ulaby and C. Elachi editors, Artech House, Inc., 1990. L.V. Elizavetin and E.A. Ksenofontov, "Feasibility of precision-measurement of the Earth's surface-relief using sar interferometry data," Earth Observation and Remote Sensing, vol. 14, pp. 101-121, 1996. D.L. Evans, "Geologic process studies using synthetic aperture radar (SAR) data," Int. Union of Geological Sciences, Episodes, vol. 15, pp. 21-31, 1992. D.L. Evans, T.G. Farr, H.A. Zebker, J.J. van Zyl and P.J. Mouginis-Mark, "Radar interferometry studies of the Earth's topography," Eos Trans. American Geophys. Union, vol. 73, no. 52, pp. 553-558, 1992. T.G. Farr and O.A. Chadwick, "Geomorphic processes and remote sensing signatures of alluvial fans in the Kun Lun Mountains, China," Journal of Geophysical Research, vol. 101, no. E10, pp. 23,091-23,100, 1996. K.L. Feigl, D.C. Agnew, Y. Bock, D. Dong, A. Donnellan, B.H. Hager, T.A. Herring, D.D. Jackson, T.H. Jordan, R.W. King, S. Larsen, K.M. Larson, M.H. Murray, Z.K. Shen and F.H. Webb, "Space geodetic measurement of crustal deformation in Central and Southern California, 1984-1992," Journal of Geophysical Research Solid Earth, vol. 98, pp. 21677-21712, 1993. E.J. Fielding, C.L. Werner, T.G. Farr and G.F. Peltzer, "Geomorphic applications of digital elevation models derived from ERS-1 and SIR-C SAR interferometry," EOS Trans AGU, vol. 76, pp. 64, 1995. G.M. Foody, M.B. McCulloch, and W.B. Yates, "Crop classification from C-band polarimetric radar data," Int. Journal of Remote Sensing, vol. 15, no. 14, pp. 2871-2886, 1994. A. Freeman, D.L. Evans and J.J. van Zyl, "SAR applications in the 21st century," Int. Journal of Electronics and Communications, vol. 50, pp. 79-84, 1996. K.B. Fung, S.M. Yatabe, T.J. Pultz and G. Fedosejevs, "Application of Remote Sensing to Environmental Monitoring: A Case Study of the 1996 Saguenay Flood in Québec," Quebec '98 Conference, Annual meeting of the Geological Association of Canada/Mineralogical Assoc. of Canada, May 1998. R. Gens and J.L. Vangenderen, "SAR interferometry: Issues, techniques, applications," Int. Journal of Remote Sensing, vol. 17, pp. 1803-1835, 1996. R.M. Goldstein, T.P. Barnett and H.A. Zebker, "Remote sensing of ocean currents," Science, vol. 246, pp. 1282-1285, 1989. H.A. Hovland, J.A. Johannessen and G. Digranes, "Slick Detection in SAR Images," Proc. IEEE Geosci. Remote Sensing Symp., IGARSS'94, Pasadena, USA, pp. 2038-2040, 1994. M.L. Imhoff and S.W. McCandless, "Flood boundary delineation through clouds and vegetation using L-band space-borne radar: A potential new tool for disease vector control programs," Acta Astronautica, vol. 17, no. 9, pp. 1003-1007, 1988. M.R. Inggs and R.T. Lord, "Interpolating Satellite Derived Wind Field Data Using Ordinary Kriging, with Application to the Nadir Gap," IEEE Trans. on Geosc. and Remote Sensing, vol. 34, no. 1, pp. 250-256, January 1996. I. Joughin, D. Winebrenner, M. Fahnestock, R. Kwok and W. Krabill, "Measurement of ice-sheet topography using satellite radar interferometry," Journal of Glaciology, vol. 42, no. 140, 1996. R. Kwok, S.V. Nghiem, S.H. Yueh and D.D. Huynh, "Retrieval of thin ice thickness from multifrequency polarimetric sar data," Remote Sensing of Environment, vol. 51, no. 3, pp. 361-374, 1995. T.I. Lukowski, P. Budkewitsch, F. Charbonneau and J. Stix, "RADARSAT-1 Interferometric Potential for Monitoring Volcanic Activity: The Guagua Pichincha Volcano, Ecuador," Proc. IEEE Geosci. Remote Sensing Symp., IGARSS 2000, Honolulu, Hawaii, July 2000. J.T. Macklin and N.R. Stapleton, "Radar backscatter statistics from the sea surface: Implications of SIR-C/X-SAR observations from the NE Atlantic," Journal of Geophysical Research - Oceans, vol. 103, no. C9, pp. 18,827-18,838, 1998. D. Massonnet and K.L. Feigl, "Radar Interferometry and its Application to Changes in the Earth's Surface," Reviews of Geophysics, vol. 36, no. 4, pp. 441-500, 1998. D. Massonnet, M. Rossi, C. Carmona, F. Adragna, G. Peltzer, K.L. Feigl and T. Rabaute, "The Displacement Field of the Landers Earthquake Mapped by Radar Interferometry," Nature, vol. 364, pp. 138-142, July 1993. P.J. Mouginis-Mark, "Volcanic hazards revealed by radar interferometry," Geotimes, vol. 39, no. 7, pp. 11-13, 1994. P.J. Mouginis-Mark, S. Rowland, R. Francis, T. Friedman, H. Garbeil, J. Gradie, S. Self, L. Wilson, J. Crisp, L. Glaze, K. Jones, A. Kahle, D. Pieri, H. Zebker, C. Wood, W. Rose, J. Adams and R. Wolff, "Analysis of active volcanoes from the Earth Observing System," Remote Sensing of Environment, vol. 36, pp. 1-12, 1991. P.A. Rosen, S. Hensley, I. Joughin, F. Li, S. Madsen, E. Rodriguez and R.M. Goldstein, "Synthetic aperture radar interferometry," Proc. of the IEEE, vol. 88, no. 3, pp. 333-382, 2000. S. Saatchi, J.V. Soares and M. Alves, "Mapping deforestation and land use in Amazon Rainforest by using SIR-C imgery," Remote Sensing of Environment, vol 59, no. 2, pp. 191-202, 1997. C.C. Schmullius and D.L. Evans, "Synthetic aperture radar (SAR) frequency and polarization requirements for applications in ecology, geology, hydrology, and oceanography: a tabular status quo after SIR-C/X-SAR," Int. Journal of Remote Sensing, vol. 18, no. 13, pp. 2713-2722, 1997. J. Shi and J. Dozier, "Inferring snow wetness using C-band data from SIR-C's polarimetric synthetic aperture radar," IEEE Trans. Geosci. Remote Sensing, vol. 33, no. 4, pp. 905-914, 1995. J.V. Soares, Renno, Formaggio, C. Yanasse and Frery, "An investigation on the selection of texture features for crop discrimination using SAR imagery," Remote Sensing of Environment, vol. 59, no. 2, pp. 234-247, 1997. T. Toutin, "Road Extraction from Stereo RADARSAT Data," Proc. of the 19th International Cartographic Conference `Touch the Past, Visualize the Future', Ottawa, Ontario, Canada, pp. 1479-1487, August 14-21 , 1999. T. Toutin and A.L. 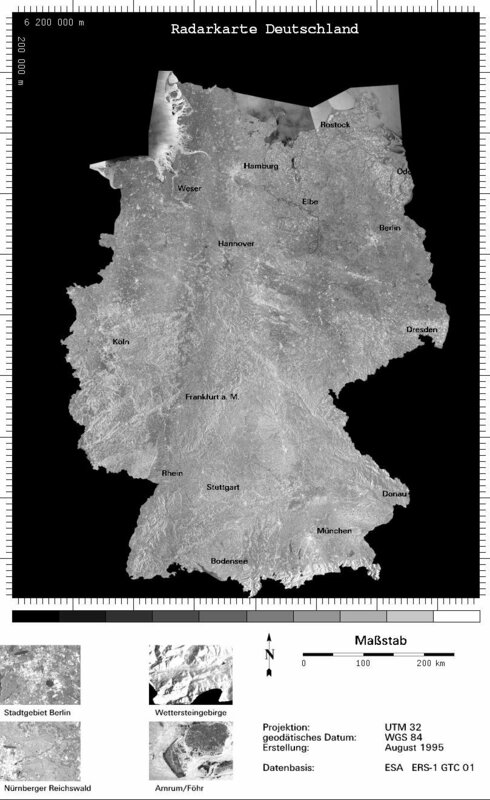 Gray, "State-of-the-art of extraction of elevation data using satellite SAR data," ISPRS Journal of Photogrammetry and Remote Sensing, vol. 55, no. 1, pp. 13-33, 2000. P.W. Vachon, K. Katsaros, P. Black and P. Dodge, "RADARSAT Synthetic Aperture Radar Measurements of some 1998 Hurricanes," Proc. IEEE Geosci. Remote Sensing Symp., IGARSS'99, Hamburg, Germany, July 1999. H.A. Zebker, P.A. Rosen and S. Hensley, "Atmospheric Effects in Interferometric Synthetic Aperture Radar Surface Deformation and Topographic Maps," Journal of Geophysical Research, vol. 102, no. B4, pp. 7547-7563, April 1997.